William Blake (1757–1827), The Wood of the Self-Murderers: The Harpies and the Suicides (Dante's Inferno) (1824-27), graphite, ink and watercolour on paper, dimensions not known, National Gallery of Victoria, Melbourne, Australia. Wikimedia Commons. 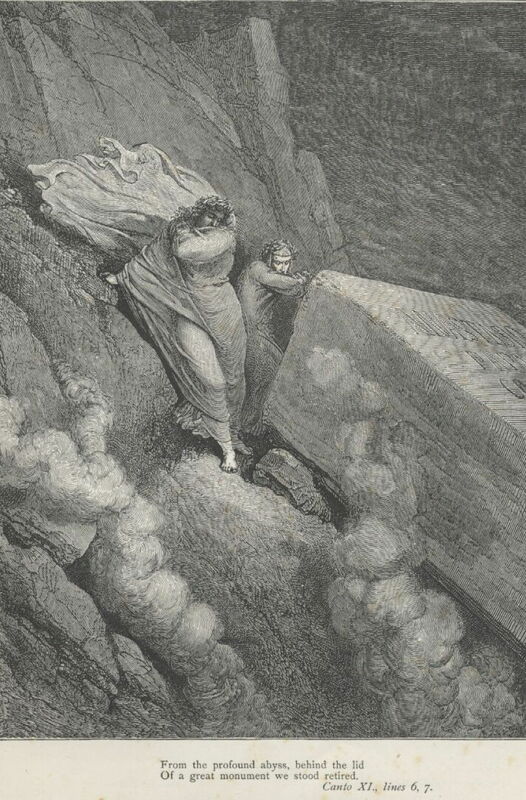 Virgil leads Dante into a gorge which takes them from the heretics further into the depths of Hell. As they descend, Virgil advises that they take their time so they can become accustomed to the stench emanating from those depths. This affords him time to explain to Dante the layout of the parts into which they are about to enter. Within the next pit are three sub-divisions, catering for the sins of malice in their different forms. The first ring is for those of violent will, and is divided again into three, for homicides and bandits, for suicides, and blasphemers. Dante’s verbal description of these sub-divisions can readily become confusing, and has been turned into diagrammatic maps by several artists. 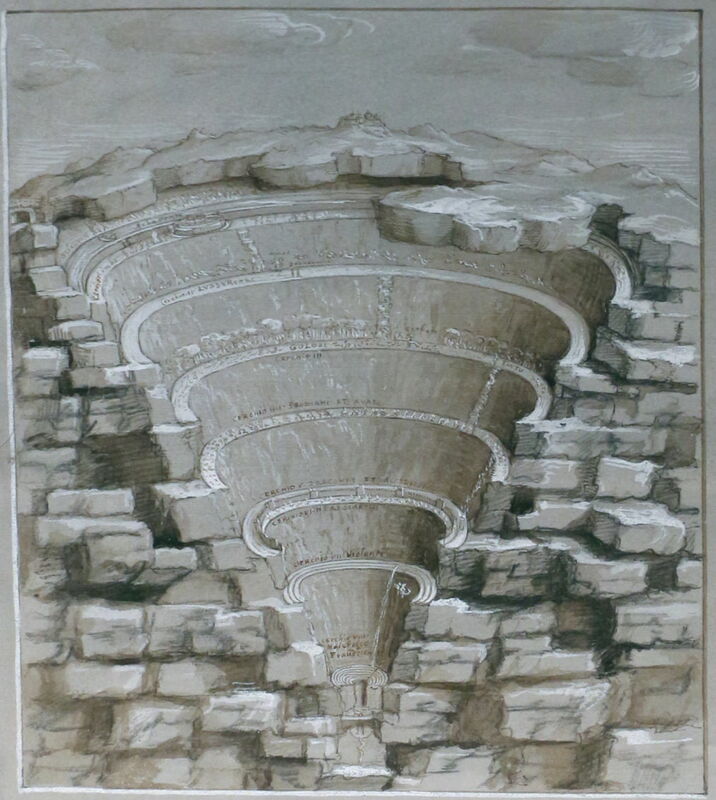 Sandro Botticelli (1445–1510), Map of Hell (1480-90), silverpoint, ink and distemper, 33 x 47.5 cm, Biblioteca Apostólica Vaticana, Vatican City. Wikimedia Commons. 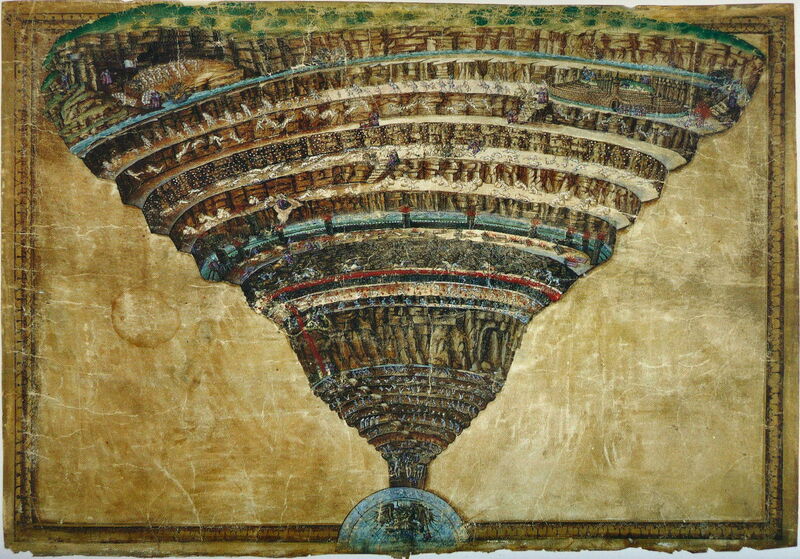 One of the most famous is Botticelli’s Map of Hell from 1480-90, in which these lower zones are shown as a funnel at the bottom, leading to the Devil himself. Jan van der Straet, alias Giovanni Stradano (1523-1605), Diagram of Hell for Canto 11 (1587), further details not known. Wikimedia Commons. Jan van der Straet’s diagram from 1587 is similar in form, and packs these zones into the narrow section at the foot. Gustave Doré (1832–1883), Inferno Canto 11 verses 6-7 (c 1857), engraving, dimensions and location not known. Wikimedia Commons. 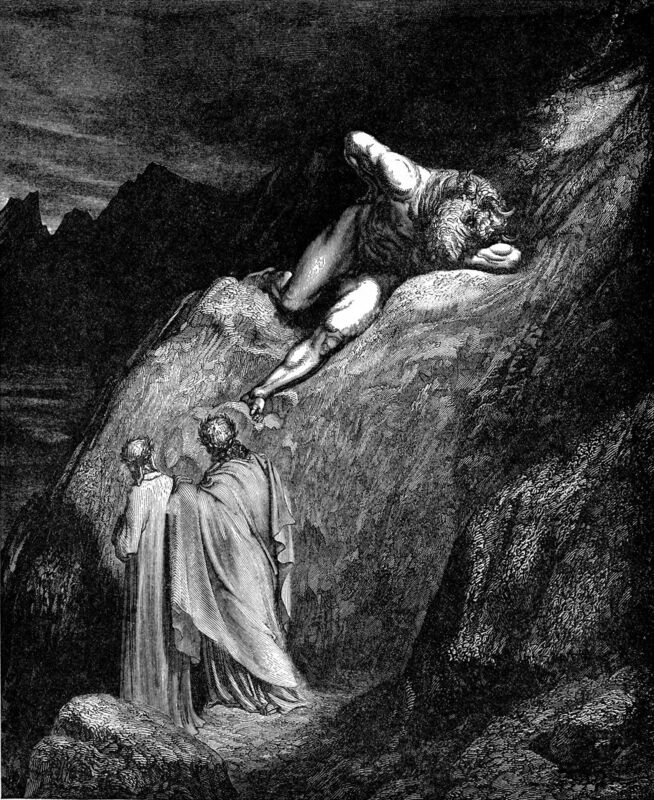 Dante opens Canto 12 as the pair are scrambling down boulders as if in the Alps, dislodged during the earthquake which resulted from Christ’s harrowing of Hell, to meet the Minotaur from Crete. 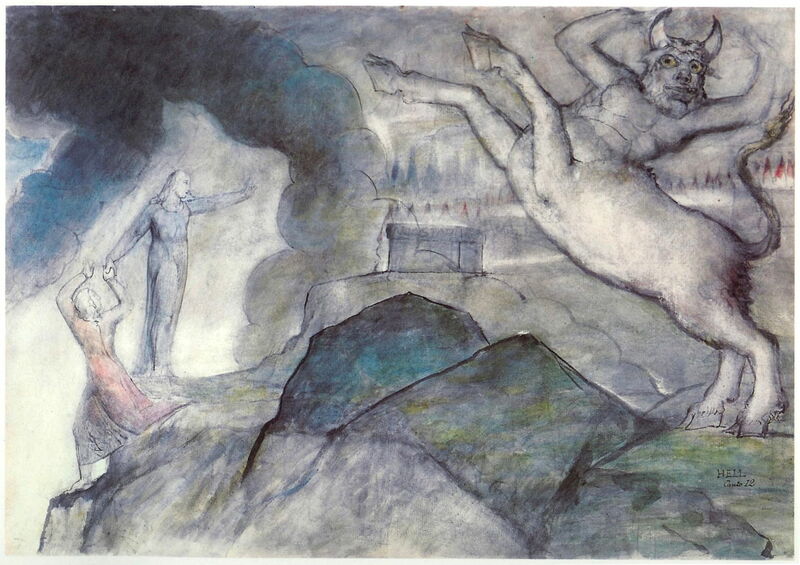 William Blake (1757–1827), The Minotaur (Dante’s Inferno) (1824-27), watercolour over pencil, dimensions not known, Fogg Art Museum, Cambridge, MA. Wikimedia Commons. Gustave Doré (1832–1883), The Minotaur on the Shattered Cliff (c 1857), engraving, dimensions and location not known. Image by Karl Hahn, via Wikimedia Commons. Like so many of Dante’s beasts, the Minotaur is drawn from classical mythology. This monstrous cross between a bull and man was kept in the labyrinth on Crete, where it was periodically fed with young Greek men and virgin women. 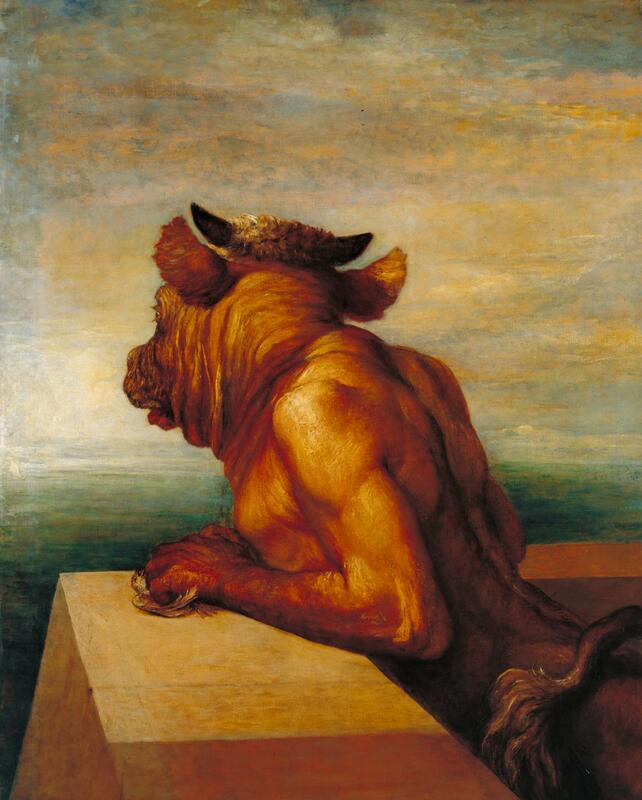 For George Frederic Watts, in his painting of The Minotaur from 1885, it represented the worst of Victorian society and its moral values: the industry of child prostitution which flourished in London at the time. 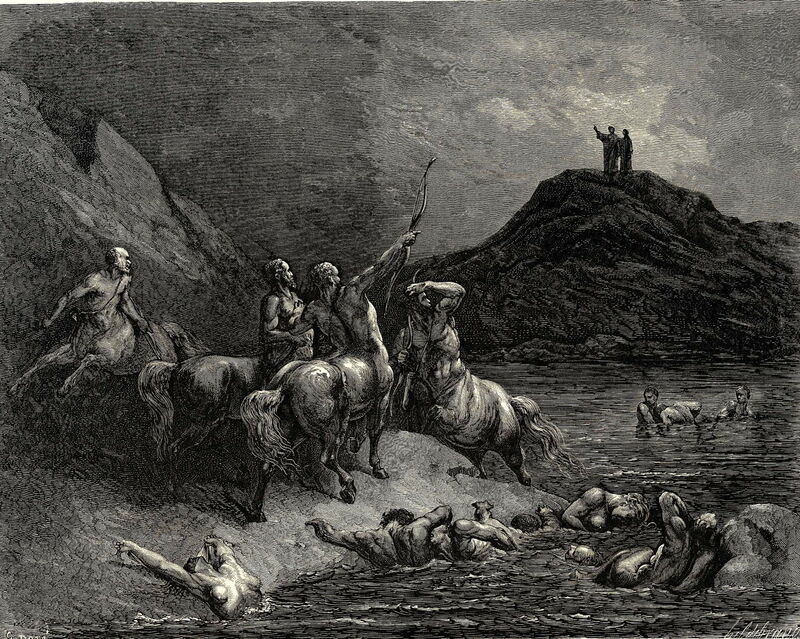 Dante and Virgil hurry past the Minotaur when they can, and continue their descent through fallen boulders and scree, to enter the seventh circle, for sins of violence. They are then hailed by one of a group of centaurs, who are armed with bows and arrows. Virgil responds that they will discuss their mission with Chiron, rather than the hot-headed Nessus. Gustave Doré (1832–1883), Inferno Canto 12 verse 1 (c 1857), engraving, dimensions and location not known. Wikimedia Commons. Chiron directs Nessus to aid Virgil and Dante in their passage. Joseph Anton Koch (1768-1839), Dante on the Back of Nessus (1808), etching, 39.8 x 31.4 cm, Fogg Art Museum, Cambridge, MA. Wikimedia Commons. They pass along the rocks beside the damned souls, who are immersed in boiling blood to a depth appropriate for their sins. 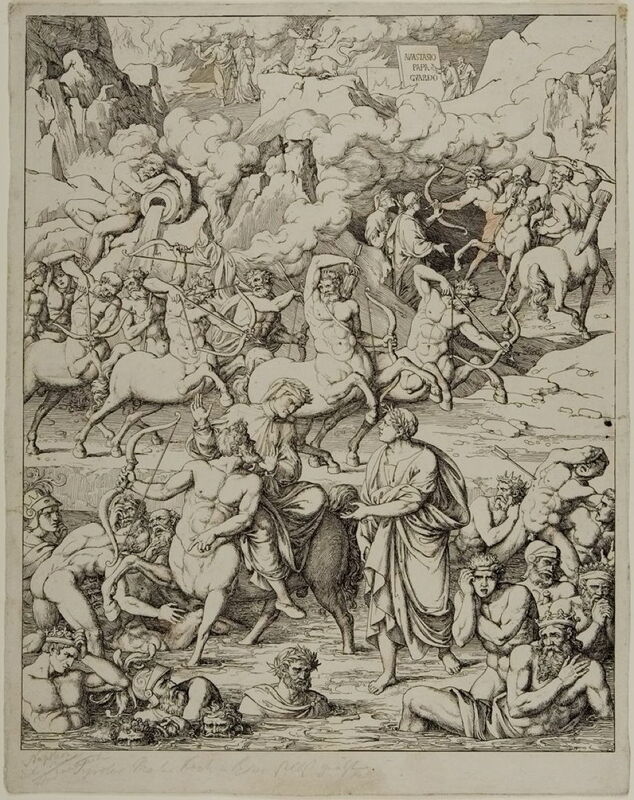 Dante recognises some as they go: Alexander the Great, Dionysius the Elder and tyrant of Syracuse, one of the d’Este family who was suffocated by his own son. Further on is Attila the Hun, Pyrrhus, Sextus the son of Pompey, and a couple of infamous contemporary highwaymen. 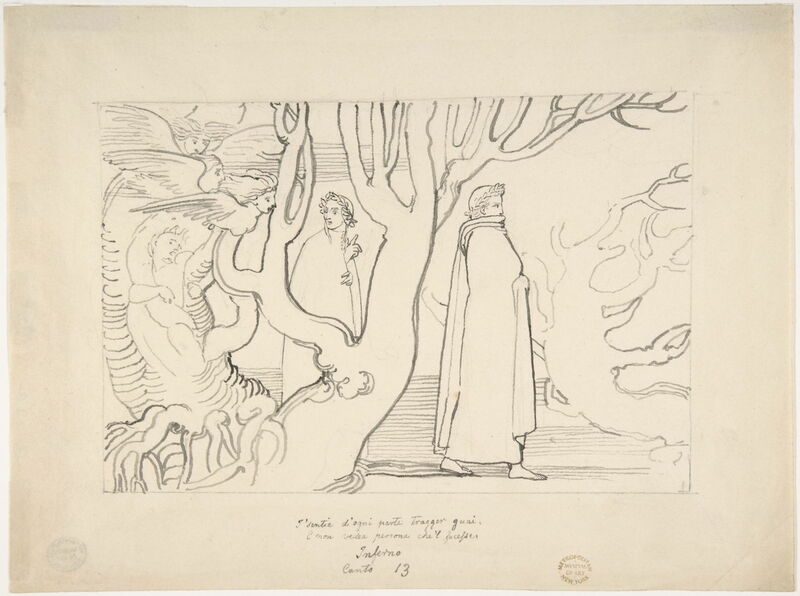 Virgil then leads Dante into a strange wood, whose thorn trees form the nests of Harpies. These composite creatures have the heads of humans, but the bodies and talons of birds, and live in sub-ring number two. In classical legend, the Harpies inhabited the Strophades, islands where they attacked Aeneas and his companions during Virgil’s Aeneid. John Flaxman (1755–1826), Dante and Virgil in the Suicidal Wood (Inferno, Canto 13, verses 22-23) (1792-93), reed pen and black ink over graphite, 19.1 x 25.7 cm, Metropolitan Museum of Art, New York, NY. Wikimedia Commons. William Blake (1757–1827), The Wood of the Self-Murderers: The Harpies and the Suicides (Dante’s Inferno) (1824-27), graphite, ink and watercolour on paper, dimensions not known, National Gallery of Victoria, Melbourne, Australia. Wikimedia Commons. 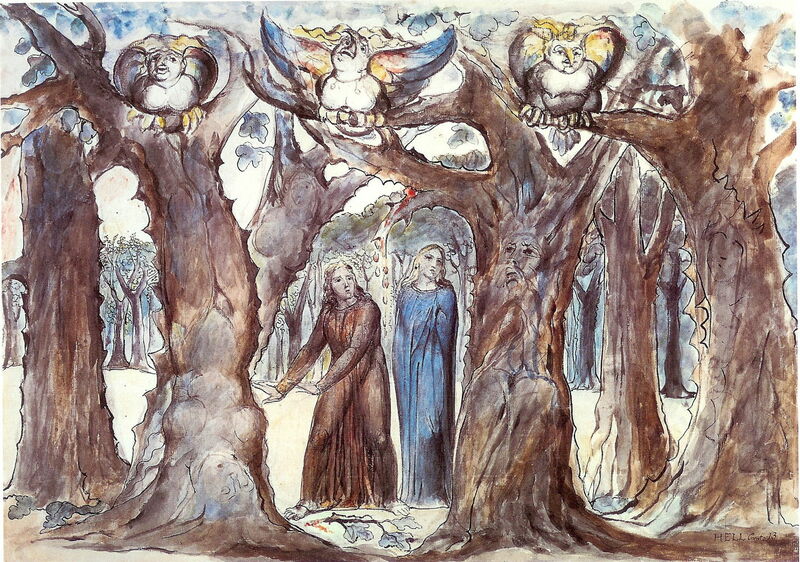 Virgil tells Dante to break a small branch from one of the trees. When he does, the tree screams out in pain, and the wound oozes blood. The tree explains that they were once people, but had taken their own lives. In this case, Dante is talking to the poet Pier della Vigna, who was ruined by envious rivals. 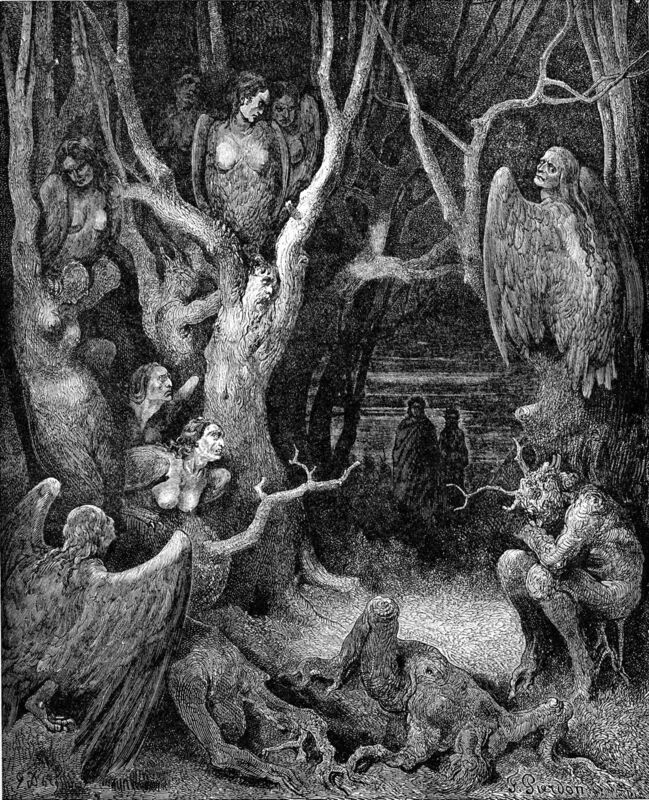 Gustave Doré (1832–1883), Harpies in the Forest of Suicides (c 1857), engraving, dimensions and location not known. Image by Karl Hahn, via Wikimedia Commons. Gustave Doré (1832–1883), Inferno Canto 13 (c 1857), engraving, dimensions and location not known. Wikimedia Commons. 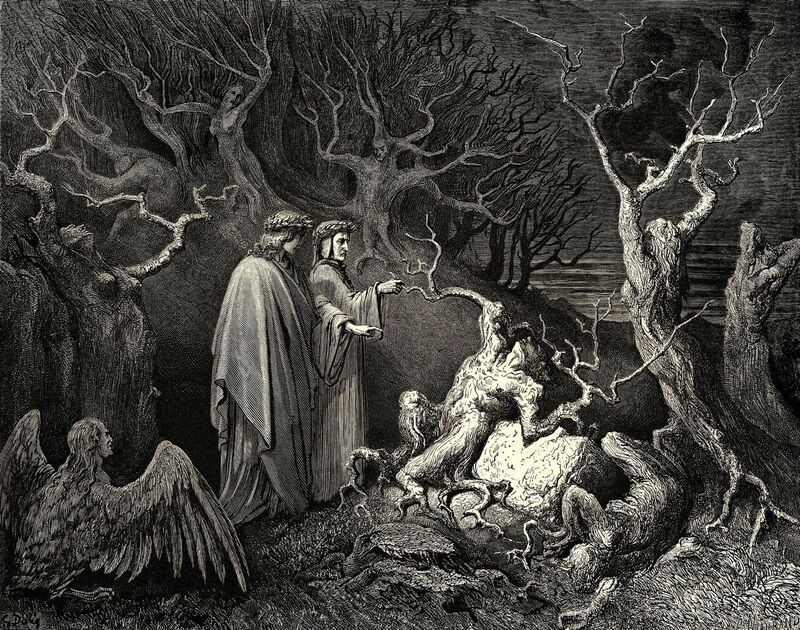 Dante is filled with pity for the spirit, who can only look forward to the Day of Judgement, while they are tortured by the Harpies feeding on their leaves. After learning of another two suicides from Siena and Florence, Dante moves on in profound sorrow. Sandro Botticelli (1445–1510) was one of the leading painters of the early Southern Renaissance, working in his native city of Florence. In addition to his huge egg tempera masterpieces of i (c 1482) and The Birth of Venus (c 1485), he was a lifelong fan of Dante’s writings. He produced drawings which were engraved for the first printed edition of the Divine Comedy in 1481, but these weren’t successful, most copies only having two or three of the 19 which were engraved. He later began a manuscript illustrated edition on parchment, but few pages were ever fully illuminated. Jan van der Straet, also commonly known by his Italianised name of Giovanni Stradano (1523-1605), was a painter who started his career in Bruges and Antwerp in Belgium, but moved to Florence in 1550, where he worked for the remainder of his life. Mannerist in style, he worked with printmakers in Antwerp to produce collections of prints, including an extensive set for The Divine Comedy. Posted in General, Life, Painting and tagged Blake, Botticelli, Dante, Divine Comedy, Doré, Flaxman, Koch, narrative, painting, Stradano, van der Straet. Bookmark the permalink.